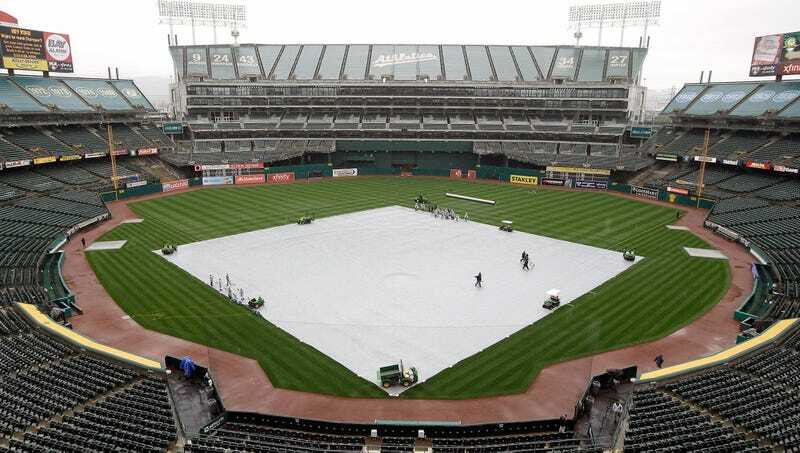 OAKLAND, CA—Describing the massive, water-resistant sheet as a “major step forward” in the stadium’s rain deferral technology, the Oakland Athletics unveiled a groundbreaking new tarp renovation Thursday for the Oakland Coliseum. “This state-of-the-art tarp is going to bring the A’s ground maintenance capabilities into the 21st century,” said owner John J. Fisher, explaining that the tarp, made from an innovative high-tensile woven polyester fabric, was the biggest renovation the team has undertaken in three decades and will replace the outdated tarp that the stadium had used since 1972. “We are committed to giving the A’s fans the best experience possible, and this tarp is tougher and more waterproof than anything available—there is no other tarp like it in Major League Baseball. We think fans are really going to love the reduced moisture content of the infield, and we hope that this new tarp will make the Oakland As much more competitive at drawing in top-name groundskeepers.” Fisher also revealed the new tarp is just the first phase of a larger stadium renovation plan that would see the bathroom floors of the main concourse completely re-spackled by 2022.